Black Women Talk Tech co-founders; and Essence Ventures CEO/founder of the New Voices Fund, Richelieu Dennis. AFRICANGLOBE – Black women startup founders CAN create billion dollar companies! That is the belief of three innovators – Regina Gwynn, Esosa Ighodaro, and Lauren Washington – who were inspired to create “Black Women Talk Tech,” a network of support and resources for Black Women tech founders. The 3rd annual Roadmap to Billions 2019 Conference, scheduled for Feb. 27 – March 1 at Union West 535 W. 28th St in Manhattan, is poised to be a stand out! NEW! Black Women Talk Tech is now collaborating with Essence Ventures CEO and founder of the New Voices Fund, Richelieu Dennis, to host a $100,000 Pitch Competition at the Conference. The engaging line up includes speakers such as – Luvvie Ajayi, an award-winning author, speaker and digital strategist who thrives at the intersection of comedy, technology and activism. Her debut book, I’M JUDGING YOU: The Do-Better Manual, became an instant New York Timesbest-seller. rlan Hamilton, built a venture capital fund from the ground up, while homeless. She is the Founder and Managing Partner of Backstage Capital, a fund that is dedicated to minimizing funding disparities in tech by investing in high-potential founders who are of color, women, and/or LGBT. Started from scratch in 2015, Backstage has now invested nearly $5m into 100 startup companies led by underestimated founders. BWTT is a collective of black women tech founders who have a unique understanding of the challenges black women startup owners face in the industry, but most importantly they understand the contribution of these innovators. The organization seeks to identify, support and encourage black women to build the next billion-dollar business. The network is the host of an annual conference The Roadmap to Billions which was developed to provide an empowering experience for black women tech entrepreneurs to learn about business growth strategies and connect with investors and other tech founders. The BWTT network with over 500 founders is the largest Black women Tech Forum nationally. 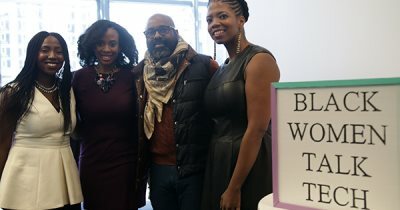 In 2018, BWTT launched chapters in Atlanta, Georgia, New York City and San Francisco, California. To learn more, please visit www.blackwomentalktech.com and their social media pages on Facebook, Twitter and Instagram.